DCOM is very large topic. This short article can not cover even small part of DCOM theory. It only explains suggested in this example architectural solution. DCOM is powerful protocol of interprocess communication within local area network between two computers or same computer. Along with ATL COM where basic codes are generated by wizards, there may be simple C coding solution. Such solution is very convenient for incorporation into finished client-server programs with minimal changes. It fits situation when you need relatively thin client communicating to large application sitting in LAN. 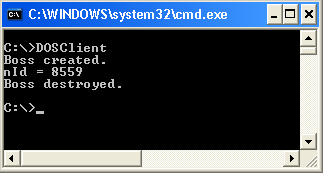 Client and Server are executables and proxy/stub is DLL. There is no mystery in DCOM connections. It is only a network protocol running over socket connections. Server is program that is sitting on particular computer and identified by global unique identifier (GUID). This GUID is recorded in registry of client computer along with the name of server computer. Client program has same GUID known in one or another form. When DCOM client starts it extracts name of the server according to GUID, finds server computer and instantiate server executable remotely via special protocol that is used then to supports communications. The same DLL that is called proxy/stub and used by OS for communication must be sitting and registered on both computers. On the client side it is called proxy. On the server side it is called stub. We start explanation from proxy/stub. DOSClient is simple and straight forward project. It illustrates advantage of simple approach to DCOM architecture, because interface functions are simply called as if it was part of DOSClient. Two files generated by MIDL compiler along with GUID are included in build. The pointer to server interface functions pDOSServer is obtained by CoCreateInstance function. This is, probably, all that is necessary to know about DOSClient project. As it was already mentioned server must be registered before it start functioning as DCOM application. When called by OS as DCOM application it executes RegisterClassFactory() and switch to loop of monitoring windows messages. When client is connected and served it breaks the loop executes RevokeClassFactory and terminate self.